Conditioned leaders have a mind, body, heart, and spirit that gets its sustenance out of addressing the gaps in our personal and professional infrastructure. I have just spent two wonderful days at an IHI conference, the Institute for Healthcare Improvement. I devoured two days of amazing training from the best of the best experts when it comes to the provision of quality patient centered care and process improvement. I was in the company of more than 140 diverse and amazing people that are as passionate about safe healthcare as I am. It was a reaffirmation for me of why I do what I do. I love the execution of process improvement. I like to push buttons and see what happens professionally and personally. When it comes to process improvement I seek it in healthcare, I seek it at the gym, in my diet, in my marriage, and my interpersonal relations. What we discussed most at IHI over the two days was the “gap” and all of the elements that go into it. 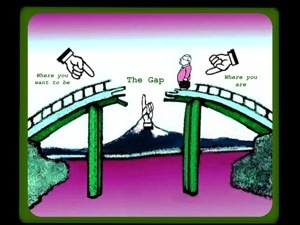 The “gap” is that place between what you want to achieve, and your abilities and capacity to get there. I had read about minding the gap while on the plane as I flew into Boston just the day before. It was one of those very relevant times when something new you have learned keeps popping up and adds to your abilities, thus creating additional clarity and capacity to achieve a specified goal. Over the next two days the conversations kept coming back to the same theme: engagement and execution. How do we engage our healthcare work force to be patient first and process improvement focused? We whined “It’s hard!”. “Your’e darn right its hard.” they told us. The attendees, as well as I, arrived I think expecting some magic pill, just as a patient does when they go to the doctors office. We struggled with how to execute all of the good stuff we were learning. One of the keys to process improvement is the ability to execute. The ability to execute takes fortitude and self-mastery. The ability to execute takes the fortitude to overcome failures, and the self-mastery to see and know ourselves as we authentically are. In order to execute we need to become comfortable with our failures. Execution comes when you know who you are, are able to keep your ego in check, and can take full responsibility for your decisions. It isn’t that great leaders don’t ever make mistakes, it’s just that they aren’t afraid of doing so. With self-mastery comes self-confidence. Self-confidence comes from building a solid personal and professional infrastructure. Self-confident people are more inclined to positively contribute to meaningful conversations and offer, as well as accept positive suggestions for improvement. Their inner-security provides a sturdy framework when it comes to dealing with the tough stuff. They are comfortable with the fact that they don’t know it all and aren’t afraid of what they don’t know. They are curious souls and seek opportunities for learning. They enjoy and surround themselves with smart people and, like a sponge, will soak up whatever new tidbits of knowledge they can. They encourage debate not for argument sake, but because they love to explore the opposite view. When self-confident people take risks and fail they don’t stay down long, they relish in the next great opportunity for improvement.